There is a new church that’s coming to McMinnville in 2012, Cowboy Church of Warren County. Plans are in the works and interest is building as this new church gets saddled up to reach those who enjoy and relate to the country way of life. It’s specifically for those who haven’t been in church in a long time or may have never been in church before. There will be a special information meeting for those who’d like to know more on Tuesday, March 20th at 7 p.m. at Bridges of Hope Fellowship on Smithville Hwy in McMinnville. Everyone is invited to attend! 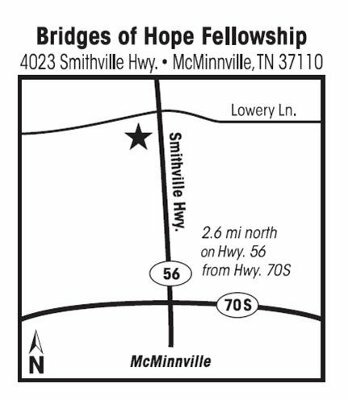 Bridges of Hope Fellowship is working to develop this new church slated for Warren County. Pastor DeWayne stated, “After over a year of praying about the possibility of planting a Cowboy Church in Warren County, God began to put the pieces of the puzzle together and open a door to reach people that our church might never have the opportunity to reach. We don’t see it as competition, since as the body of Christ, we are all on the same team. It’s about reaching and loving people into a relationship with an awesome God!” Pastor DeWayne and the Bridges of Hope congregation are delighted to host this informational meeting. During the meeting, Fred Davis, a horse enthusiast from Hartsville, Tennessee and Church Starter Strategist for the Tennessee Baptist Convention will be on hand to talk about the future and what’s expected at Cowboy Church of Warren County. Fred is and has been instrumental in the starting of many Cowboy churches across the state of Tennessee. Also attending will be Todd Mitchell, Southern States Strategist for the American Fellowship of Cowboy Churches, based out of Ellis County, Texas. Todd has personally planted Cowboy churches, including the one he most recently founded in Alabama which averages over 400 in attendance each weekend. As a special treat, Christian Country Artist, Greg McDougal will be sharing in song during this special information meeting. Greg is an award winning Country Gospel singer and musician who travels coast to coast performing to crowds in stadiums, rodeos, concert halls, television, and Cowboy Churches. Greg’s music can be heard on radio stations around the world. Parking is available in the front lot and the overflow lot located to the side of the building. Sorry. Childcare will NOT be provided for this meeting.